Up until a week ago, people in Sudan were required a permit to play music late at night — an indication of just how tightly President Omar al-Bashir held the country in his iron grip. Now, as the nation grapples with the end of his 30-year dictatorship, music has become a defining part of the protest movement, with singing and dancing continuing around the clock. The tens of thousands of demonstrators gathered in front of the military headquarters in the capital Khartoum aren’t heading home anytime soon, vowing to remain in the streets until civilian rule is guaranteed. Walk among the mostly young protesters and you’ll find a highly organized party atmosphere, with demonstrators working in shifts to ensure the DJ’s sound system is never silent for long. Free sandwiches and water are handed out to the crowd. Young men and women hold donation boxes for passing drivers to contribute to the cause. As Ramadan approaches, some local NGOs have put the call out for professional cooks to donate their time helping prepare provisions to enable protesters to break their fast while continuing to demonstrate. 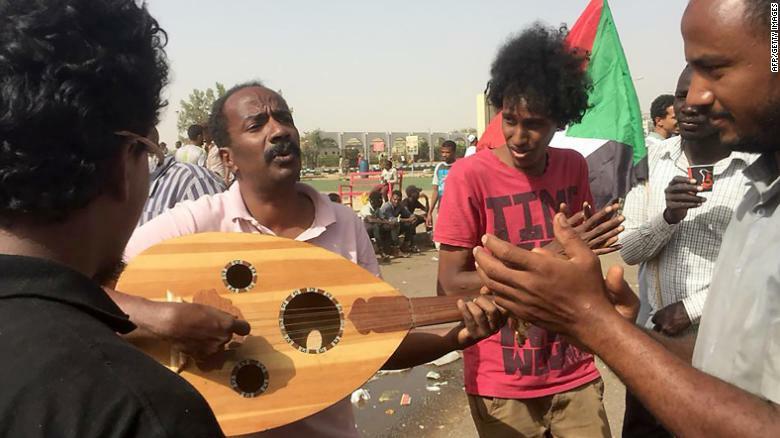 Demonstrators play music in Khartoum. Some female protesters are already beginning to drop their headscarves, something previously unthinkable for many in conservative Sudan. Women who would previously be flogged simply for walking with a man they weren’t related to, are now standing side-by-side with male protesters late into the evening. The ongoing demonstration comes as the transnational military council continues to arrest former regime officials. Among them are Bashir, his former interior minister Abdelrahim Mohamed Hussein, and former head of the ruling party Ahmed Haroun, who will all be charged with corruption and the death of protesters, two sources with direct knowledge of the events told CNN. The three men are all wanted by the International Criminal Court for war crimes related to atrocities in Darfur. 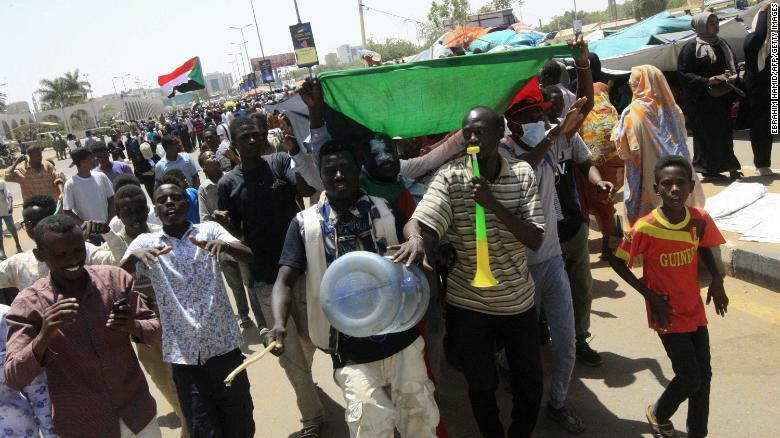 Sudanese protesters celebrate on April 13. With Bashir’s government now dissolved, a military council has assumed control for two years to oversee a transition of power. But amid the celebratory demonstrations, there have also been outbreaks of gunfire between the remnants of the old regime and the new military caretakers. Fueling the persistence of the protesters is the example of the 2011 Arab uprising which promised so much — and in the case of neighboring Egypt, delivered a dictatorship likely worse than the one it ousted. Almost every protester we spoke to said they had at some point been detained during the demonstrations. One young man, Taha Alhadi, told CNN he had been arrested three times, repeatedly beaten with a rubber hose, and held in the “Refrigerator,” one of the torture and detention “ghost houses” whose existence was denied by Bashir’s regime. For a generation who have only ever known Bashir’s rule, music has become a source of strength and a call for unity on the uncertain path towards democracy. Young men previously recruited into the national defense service have repurposed the Islamist songs they were forced to sing into protest chants. “Running is ugly! The brave walk on fire! The brave walk through coal!” they chant at the top of their lungs. The words are same. But this time around, the message is very different.